These vintage beds are a fantastic addition to our large range of vintage and industrial furniture. 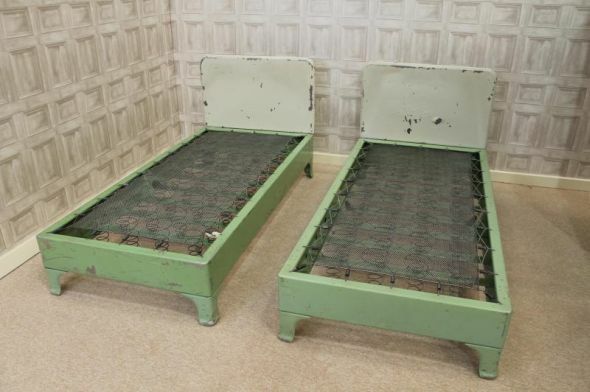 Ideal for any studio apartment or retro interior, these original vintage beds could be left in their original shabby chic paintwork, or they could be stripped and polished to make a fantastic feature in any bedroom. These beds are more or less ready to go; all that is required are standard single mattresses as they both have sprung bases. With their fantastic rustic vintage appearance, this pair of vintage beds would make a great focal point in any retro bedroom interior. We stock a wide range of antique and vintage items. Please see our other listings for details, or contact us on 01543 375872 for more information. Sorry, these items are now sold.